A team of University of Notre Dame MBA students won the first annual Fuqua Finance Case Competition with their proposed solution for valuing an international satellite telecommunications company verging on bankruptcy. 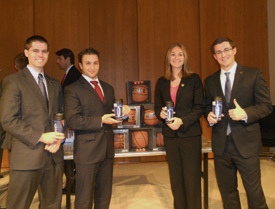 First-year MBA students Zachary Schneider, Michelle Purvis and John Vicente and second-year student David Young traveled to Duke University for the Nov. 11-12 event to compete against four other teams: the Stockholm School of Economics, George Washington University, and two teams from the Fuqua School of Business. The case consisted of two rounds, with Notre Dame and the two Fuqua teams advancing to the second and final rounds. The judging panel consisted of investment bankers from Suntrust Robinson Humphrey’s media and telecommunications group as well as R.W. Baird’s technology, media and telecommunications group. Bank of America sponsored the competition, along with Suntrust and R.W. Baird. The winning team took home a cash prize of $5,000. The case asked teams to explain how the near-bankrupt telecom should be valued, and to justify their explanation. They also had to pinpoint areas of failure in corporate governance and recommend strategies going forward in how to mitigate such failures in the future. The Notre Dame team took a two-pronged approach that focused on stakeholder theory and what dictates good corporate governance, as well as a multiples analysis of comparable companies that trade in the public markets. During the week-long Interterm Intensives, the MBA students analyze, investigate and offer solutions for real-life problems presented by executives from large global organizations. 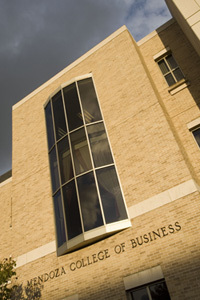 The Notre Dame MBA is ranked No. 4 on the Aspen Institute’s “Beyond Grey Pinstripes” survey and 24th among U.S. business schools by Bloomberg Businessweek. Originally published by Carol Elliott at newsinfo.nd.edu on November 23, 2011.